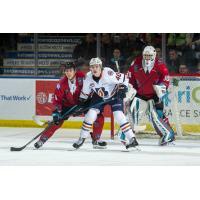 The Kamloops Blazers defeated the Kelowna Rockets 2-1 Saturday night at Prospera Place in Kelowna, BC. The Rockets and Blazers exchanged chances throughout the opening frame. The Rockets had the lone opportunity on the man advantage when the referees sent Montana Onyebuchi to the box just before the midway point of the period; Kelowna was unsuccessful. Just like the night before, the two entered the first intermission in a scoreless tie. Six minutes into the second period, Kyrell Sopotyk (11) gave the Blazers a 1-0 lead. Kyle Topping (22) would answer for the Rockets at 13:04. The Rockets and Blazers once again headed to the intermission tied. Kamloops captain, Jermaine Loewen (25) restored the Blazers lead 9:01 into the third period. The Blazers were able to hold off the Rockets for the rest of the period. The Kelowna Rockets record is now 27-31-5-2. Basran turned aside 27 of the 29 shots fired on him, his record moves to 19-18-3-1. The Blazers outshot the Rockets 29-28. The Rockets will return to action on Wednesday when they host the Spokane Chiefs for the final Hat Trick Wednesday of the season. Purchase your tickets before 2:00pm on game day and you can get a hot dog and a pop with your ticket for $19.99! Tickets are on sale at selectyourtickets.com, at the Prospera Place box office or by phone at 250-762-5050.